If your pup won’t come that means that he is already leading the relationship in his mind. I hate to break this to you (who am I kidding…I love teaching) but your dog’s disobedience of the “come” or “here” command is actually a much bigger deal than you originally thought! And what with the accelerated growth rate of our pups you will probably discover (if you look into it) many accelerated manipulations of the personal space around your pup. Once a pup has control over his own body and his own personal space there is nothing to stop him from expanding his territory to other things in his environment. The real answers lie in first identifying all the subtle manipulations that our pups get away with and then knowing how to calmly stop them. This is where I can help dramatically. Order my Hot Listed book on dog and human behaviors, DOG MYTHS: What you Believe about dogs can come back to BITE You! I’ll put a link to my shocking and yet inspiring training book at the bottom of this article. I don’t have time in this short blog post to go into every subtle puppy manipulation that could be happening in your case because it would be like trying to learn an entire language from a simple blog article. It cannot be done. However, if you follow my four ways to strengthen your puppies recall this can greatly help stop your loving pup from acting like such a brat and prevent him from growing that bratty behavior into serious future behavioral issues. Never call an unreliable dog. This means avoid the temptation to say, “Come” or, “Here” to your dog or pup! Don’t do it. Keep your mouth closed! [Please read our post entitled Shut your mouth if you want to talk with Mother Nature] This is an extremely hard rule to follow for us as humans! Be aware you probably will fail at this from time to time. That’s OK if it’s only happening a few times…it is totally unacceptable and foolhardy if it becomes a practice. Sadly, it usually is practiced and it gives our pups the ability to simply, defiantly give us the doggy middle finger by clearly disagreeing with our recall command! 2. Use the leash. The leash should be your best friend if you’ve got a puppy or dog who will not come. Have them wear it much more often. Have them drag it around the house for hours at a time. The leash will slow them down a bit (both mentally and physically). If your pup is on leash and you want to say, “Come” or give a recall command by all means go ahead because now (on leash) you can easily disagree when he disagrees with you by not coming. If your pup won’t come after you’ve given the command and he is on leash -Give a quick or short tug and then gesture into the recall position. Remember, dogs prefer body language to verbal language. He will begin to come toward you. As soon as he starts towards you verbally praise a little and upon his finishing a clean “Come” command (meaning the pup’s head is almost touching your knees and he is directly in front of you) verbally praise more and be sure to pet and touch your pup. You should be raising your energy and the tone of your voice…we are adding excitement and making coming to us worth it in the mind of the pup. (This is rare because most other commands and just how we live our lives in general we always strive to lower the energy and we are typically looking for the animal to remain stationary -sit, down, stay or just calm depending on whether we are actively training or passively whispering). Using a toy should be when the dog is at his highest level of energy! We want the pup really engaged and snapping at the tug or rope! If you develop your pup’s natural prey drive you can quickly work a very reliable recall and you can get several repetitions in! Imagine you have a dog who loves to play fetch and chase the ball or stick. Now imagine how easy it could be if every time your dog (who loves to play fetch) learns that the second half of that game is the same exact body movement as performing the “come” or “here” command. It can be extremely easy if we don’t allow all the social manipulations to creep in. 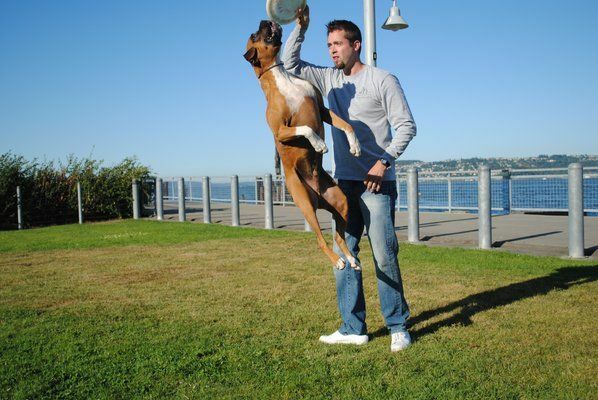 My dog Rambo jumps up high to catch the Frisbee. This is good prey drive on display! 4. Use a food treat. Make sure you don’t bribe your puppy. Reward. Never bribe. There is a difference! And don’t overdo the treats. Like the name implies they should be supplemental and occasional. I always ask my clients, “When’s the last time you had cheesecake?” Get the point?! It’s a treat not a constant. PS. If your pup can’t fetch or doesn’t bring it back because he’s attempting to manipulate control of the game and his personal space then take my advice and start playing a close game of tug of war. It will give you a chance to actually be a player in the game and it will keep the pup close and in your space. And then you can teach the dog many other things like how to calm down and energy control, the “drop it” or “give” command and other vital spacial communication. 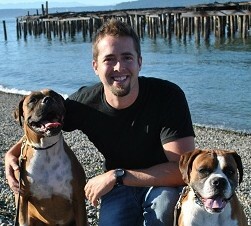 Me with my dogs Rambo and Bosley. There’s the link above so click it and reserve your copy of the book today! My newest book is now available to order! So Long Separation Anxiety This book will greatly aid you in taking a fresh look, a spatial, language-based look, at separation anxiety in dogs and pups!